On Saturday morning I woke up to a box of goodies from Minvita, an established company which sells 100% natural health products. 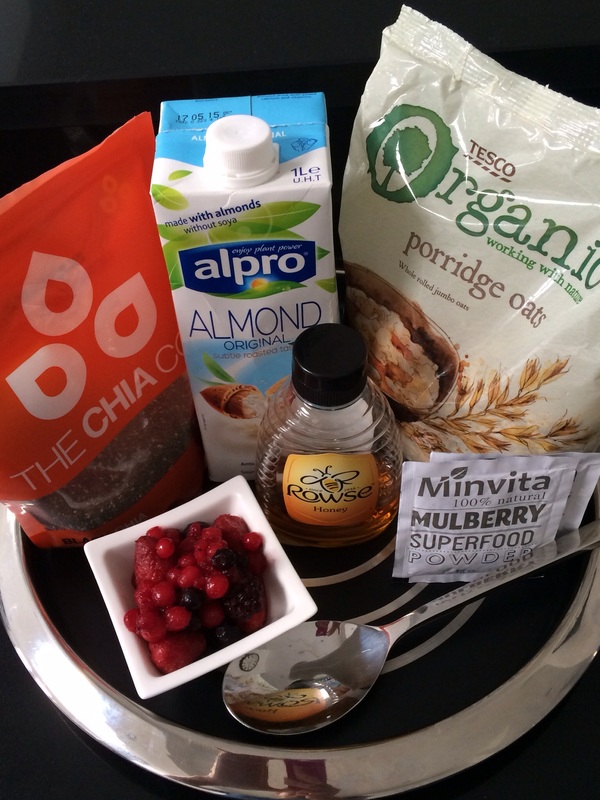 I came across their superfoods online and I loved the idea of powders which you can simply add to food. Although I am sure you may feel you have seen similar products before, I think that these stand out as some of the most nutritional I have come across, let alone completely natural and organic. 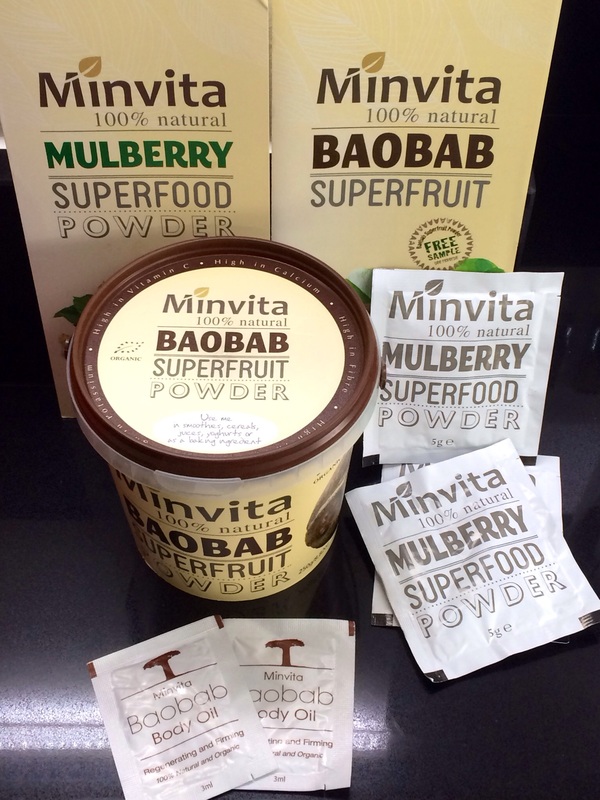 My package form Minvita contained the ‘Baobab Superfruit Powder’ and the ‘Mulberry Superfood Powder’… I really couldn’t wait to get taste testing. 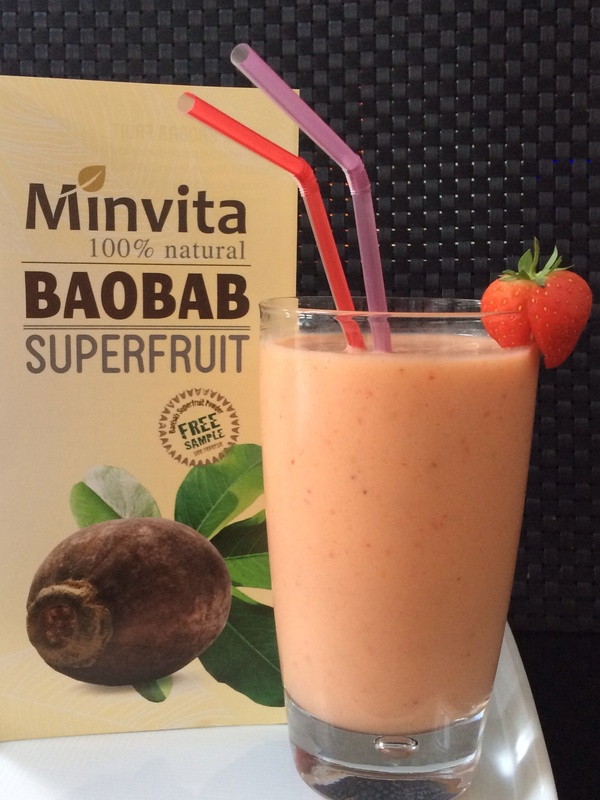 Yesterday I tried out the ‘Baobab Superfruit Powder’ and added it to my smoothie. I was genuinely shocked when I read about its unique properties. It contains high levels of iron, calcium and vitamin C, which is a great way of ensuring you manage your recommended daily allowance of these important vitamins and minerals. If I am honest I would much rather add this to my breakfast routine rather than taking a multi-vitamin pill. I added this powder to my smoothie and it was really delicious. I felt it gave it a refreshing taste and helped to quench my thirst. I am a huge fan of smoothies, but sometimes I can’t afford to add exotic fruits or those that are high in antioxidants, such as blueberries and acai. I often buy frozen fruits when doing my weekly supermarket shop. I find these perfect for smoothies, convenient and often great value for money. I take out what I need the night before and by the morning its defrosted and ready to blitz up. This Baobab powder is a perfect addition to any smoothie or juice. With just 1 desert spoonful, you instantly add a multitude of beneficial vitamins, multivitamins and antioxidants. Perfect for any health conscious individual and this comes at an affordable price of £14.69 for a 250 gram tub. 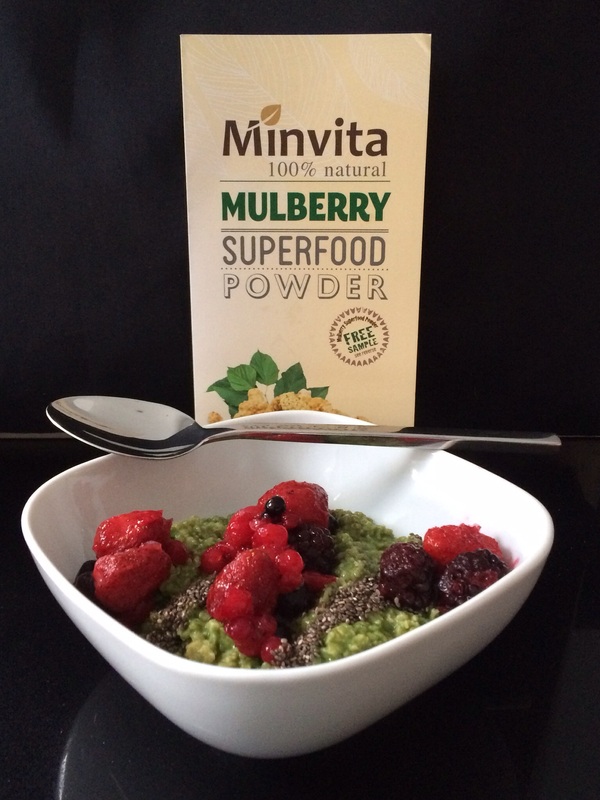 This morning I tried the ‘Mulberry Superfood Powder’. I decided to add this to my bowl of gluten free porridge oats, which I cooked up with some almond milk and a little water. When I opened the sachet I was faced with a forest green coloured powder so once I mixed this into my oats you can imagine it wasn’t necessarily the most appealing bowl of food! Maybe you could do this for Halloween and sneak some of this goodness into your kids breakfast. I mixed in a small squeeze of honey, and topped with chia seeds and mixed berries and this definitely looked more appealing. I am not sure I would add this to my breakfast again and maybe stick to Minvita’s recommendations of adding to smoothies, juices or tea! I did however feel like I had eaten a really healthy breakfast, with the added benefit of the powders ability to control my blood sugar and the added calcium in it. This powder is also high in iron and due to my current medical condition I have developed low iron levels so this was definitely a breakfast bowl bonus! This is priced at £19.99 for a 250 gram tub. The company also sent me some sachets of their ‘Baobab Body Oil’ which is great for this cold weather when I feel like all my skin does is dehydrate, itch and look a bit scaly! That’s all fine if your a reptile but not so great for any human. I have added this oil to my skin after my shower twice a day for the past 3 days and I already notice a difference. There is a increase in the smoothness of my skin texture and a reduction in the irritation from the cold weather and central heating. This 100% natural and organic body oil is suitable for all skin types has many benefits. The ability to improves skins elasticity, softness and appearance. It nourishes ageing skin and intensively moisturises. Can alleviate scaring and bruising. Rich in Vitamins B1, B2, A, D, E and F.
Contains Phosphorous, Iron and Protein. This oil is easy to use, you simply massage it into the skin and it is absorbed quickly. I have used many types of body oil before but I always get put off by the greasy residue left on my skin, but this was different. I also like the fact it can help in the reduction of scars and bruising as I am particularly clumsy since becoming ill, and am always walking into things! If there was one thing I could change about this, I would love for the oil to have a nice scent, I know super girly right?! At the same time though, I understand that this probably isn’t always possible if you want to keep the product completely natural. I really would like to continue to use this product over the next few months and hopefully have a better set of pins by next summer! 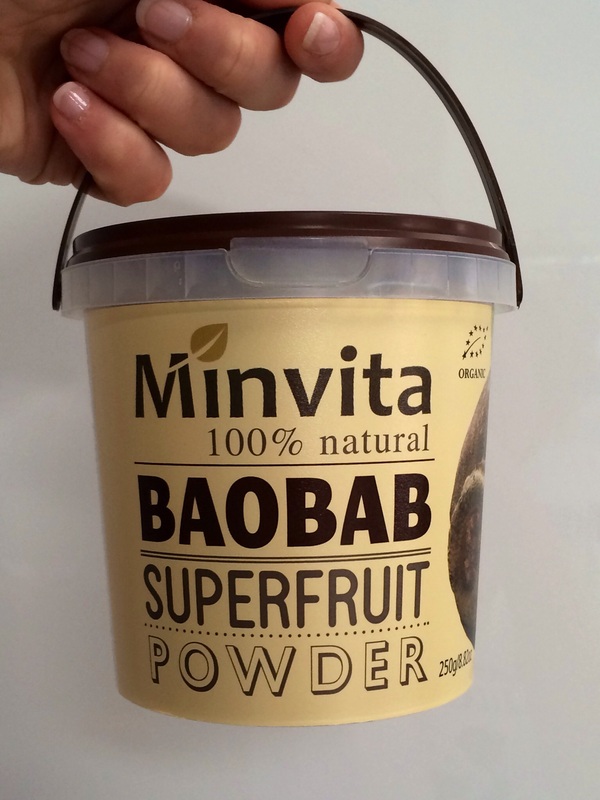 When I run out of Baobab powder, I am sure I will be purchasing another and I am keen to try the ‘Cocoa Superfood Nibs’ that are also made by Minvita. These little chocolate flavoured nibbles also contain magnesium, which is great to help combat tiredness and fatigue. This company stock a range of super-foods and beauty products which you can buy online and have delivered worldwide. You can also follow Minvita on populate social media networks; Facebook, Twitter and Pinterest. Thanks so much for reading, I really hope you enjoyed this review. Let me know in the comments if you have tried any of these products and if you have any recipe ideas using them. *Disclaimer – The products reviewed in this blog post were gifted to me from Minvita. Previous Post Motivational Monday… Some days we all need a little help. Next Post Motivational Monday… Smile and the world smiles with you.